Time to Change the US Championship Format? Back in the early days of the Soviet Union preparing to become a true world power on the chess scene they made a change to their national championship format. In 1929 for the first time there was not just an invited field. Instead, there were four preliminary groups which then became two Semi Finals where the top two finishers in each qualified for the double round robin final. Over the years they refined this format and from this sprang the most dominant nation of all time. In fact Russia remains a powerhouse on the world chess scene, almost routinely churning out top 100 players, and in no small part I believe it’s due to the fact that remnants of this system remain today with the Higher League and Super Final which continue to give up and coming players chances to improve when they need it most. Last summer I started mulling these concepts over in my mind to figure out if they could work here at home. I did this in anticipation of Dominguez making his federation switch, which has of course happened now. Here’s what got me thinking. The current format in the US Championships, which has become more or less standard, is a 12 player round robin. The first round robin championship I attended was 2014. 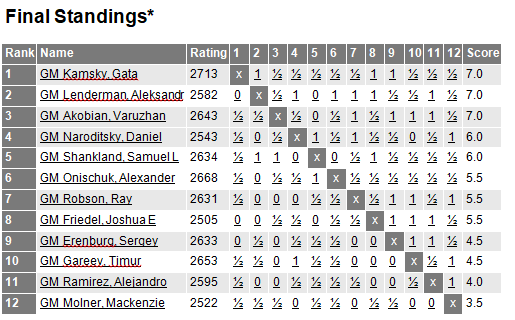 For that tournament the players could qualify with a high 2500 FIDE rating. The format for invites is that there are four automatic invites which go to the defending champion (Kamsky), the US Open Champion (Friedel), the US Junior Open Champion (Naroditsky), and a wild card (Molner). The rest were invited by rating, so as you see 2582 (Lenderman) was good enough. Of course Hikaru turned down his invite so that has to be taken into consideration, but still, just five years ago the field was at this level. 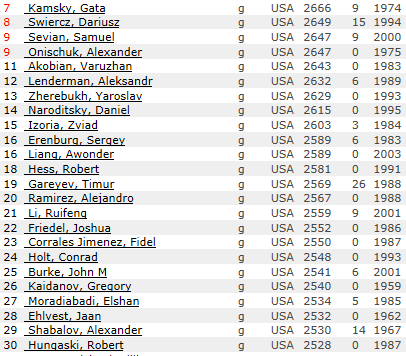 Now let’s look at the top ten FIDE rated players in the US. This is active players. Technically Dominguez isn’t active, so now you have to insert his name into this field and that means that we now have several players over 2600 (Akobian, Lenderman, Zherebukh, Naroditsky, and Izoria) who aren’t even on the radar. And not all of our top 10 players above will qualify either since spots will go to Gareyev (US Open), Liang (US Junior Champ) and a wild card. Next consider the fact that we have some insanely talented juniors rushing up the rating ranks such as Awonder Liang, Ruifeng Li, Christopher Yoo, etc. Sure, there’s no telling how far they may go, but it’s certain there will be even more behind them. So where does that leave us? Well, clearly we are becoming one of those nations where many players who would easily qualify for the national championship almost anywhere else won’t qualify for ours. 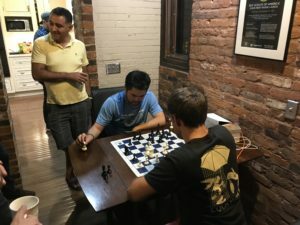 The Saint Louis Chess Club has done a wonderful job in somewhat addressing this with the seasonal “Classic” tournaments, e.g. the Summer Classic, Winter Classic, etc., but that will only go so far. What I would like to see is for the US to take what I see as the next logical step in the process and add a semifinal layer to our championship. In my mind it’s a 12 player round robin final with half of the field seeded in (defending champion, then the top five players by rating) with two other 12 player round robins sending in three players each to complete the field. This would mean that a total of 30 players are taking place in the national championship rather than only 12. This means that for spots 7-30 on our rating list, most of them will get at least one more extremely strong professional level round robin than they are now each year, and some (the top three finishers in each Semi) will get a second. Now you have some young talent like Holt and Burke who will be able to get in and fight for a spot in the finals. The current system means that they are not likely to ever make it, and certainly not numerous times. Why “most” and not “all” of spots 7-30? Because the Semifinals are now where you would seed in the US Open winner, the US Junior Closed winner, and organizer wildcards. Not all of them will necessarily be in the top 30 by rating, but that would be OK. So what is the point of all of this? It’s that if the USA is ever truly going to become a strong and sustaining chess nation then we need to make sure that the players who are somewhere between 2500-2650 continue to get chances to improve in a professional setting. The life of a chess professional outside the top 20 or so is hard. This could make it a little less so. My fear is that if we don’t do this then we are risking dropping right back off the cliff once the Caruana/Dominguez/Nakamura/Shankland/So generation hang it up. Of course this would require some investment from Saint Louis. Factoring in prizes and expenses this could cost something like $100,000 per year. Yet it just seems like the logical next step. Let’s hope someone out there is listening. 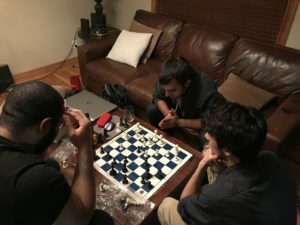 Author wainscottPosted on December 30, 2018 December 30, 2018 Categories Chess JournalismLeave a comment on Time to Change the US Championship Format? It came to my attention that this site was mentioned in the Cuban press on an article they wrote on Dominguez switching to the USA. One of the commonly repeated themes amongst a lot of players is that draws must, by definition, be boring. After all, there is no winner, so therefore it must have been a tame effort, right? Dig a little deeper though and you quickly realize that not all draws are created equally. In fact, Soviet chess journalist Leonid Verkhovsky wrote a book call Draw which contained a forward by none other than Mikhail Tal. The thrust of that book was to show that there is a difference between a tame draw where no one took risks, and draws on the edge of a knife where sensational defense made the difference. So earlier today I saw this Facebook post by GM Emil Sutovsky. So I decided to do exactly what Emil was suggesting and look at the games. I show them here for you now. Next time you see someone say something like “So many draws – how boring!” take that with a grain of salt. They may be completely wrong in their assumption. Last week my good friend GM Elshan Moradiabadi came to stay with me so we could play in the US Open. Originally we were going to play in the six day section, but the issue was that he was going to be coming in from Denmark on Monday night and we would have to start playing Tuesday night. As he had played 28 games in the month prior this wasn’t a great solution. So we decided to switch to the four day. On day one in round one I was playing NM Eli Karp. I had a great position. Clearly better. Then I drifted into equality and then wound up in an endgame where I felt I could hold as long as I did nothing. Then I decided to do something. I lost. Round Two I was playing a kid I outrated by several hundred points. I miscalculated what I thought was a temporary piece sac which would allow me to either win a pawn or bust open the position. Unfortunately I missed an intermezzo and he won a piece. Round Three I was again playing a kid I outrated by quite a bit. I was playing well and was in the process of converting when I hung a rook. It was at this point that I realized that I had a psychological issue. Essentially I was playing pretty well, then managing to fall apart. Round Four was the one round where I simply played poorly from the start. So at the end of the day I was 0-4. The next day I came back with renewed focus. I was determined to play much better than I had been. Round Six I played another kid, but he missed a simple win of a pawn in the opening and then let me trade down into an easily winning K&P endgame. 2-4, and more importantly the G/60’s were over. Round Seven was the only time I played someone I knew. I played horribly in the opening but wound up winning quite easily. 3-4, and at the end of the day I had won ever game after losing them all the day prior. Round Eight…only one game that day, and again I had a pretty smooth conversion. So now I sat at 4-4, and more importantly as my original goal going in to the tournament was to go 5-4 and finish +1 I now had a chance to do just that. That brings us to Sunday afternoon…Round Nine. I had hoped to get one more chance to play up, and when I saw my pairing against wunderkind Alice Lee I realized I had gotten that chance. I’ve read on a few occasions about the death of players at tournaments. It happens. But you don’t expect it to happen at an event your at. This was maybe 50 feet from me. The playing hall devolved into utter chaos. Some people (myself included) stopped their clocks while others tried to keep playing. Eventually after some time most people had stopped their clocks. When the paramedics were pulling in the staff made sure that all games were stopped and people were out of the way. The paramedics arrived and began frantically working on the gentlemen who collapsed. They did so for about an hour or so and then we were suddenly informed that we all needed to leave the room. I assumed this meant that the gentlemen who collapsed didn’t make it, and sadly that turned out to be the case. There was a delay of about three hours total, and during that time many players agreed draws without resuming. I had offered one to my opponent since she said that she was scared. She decided that she wanted to play. When we resumed I simply couldn’t focus (nor could many others) and quickly went astray in a tactical position. So when all was said and done I finished 4-5, but really I can live with that. I managed to keep myself from falling apart after my day one disaster, and in the process I learned quite a lot about myself. I’ll work on analyzing some of the more interesting games and posting them soon. As for Elshan, he wound up 7-2, drawing four GM’s and beating all non-GM’s he played. He fell a point short of Timur’s performance, but all in all after playing in four countries for five weeks straight it wasn’t anything to be ashamed of. These Guys Want to Meet a GM. Let’s Help Them! 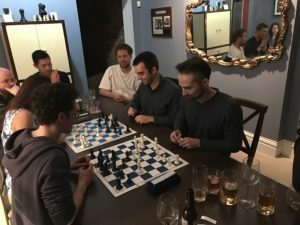 I think that for those of us who may live or play in areas that have a relatively high population density of Grandmasters we get to a point where we are almost taking them for granted. We see them at tournaments. Attend their lectures. Perhaps take lessons from them. They are our friends/coaches etc. But it’s not like that for everyone. And really, if you’re one of the lucky ones like me who interacts with GM’s all the time it wasn’t always like that for you either. Think back to a time when you had started playing but hadn’t yet met a Grandmaster. The first time you were in a room with one you were probably trying to make sure that this wasn’t just a dream. I personally was almost pinching myself in awe. It was like being in the same room with a mythical being, if for no other reason than it was something that I never was sure would ever really happen. Well, for these guys it’s like that right now. They want a GM to come to their club and give a lecture/simul, but they can’t do it on their own. S0 I’m asking everyone who reads this to just do something. Even $1 would be massive if enough people stepped up. To you $1 is practically nothing. To these guys a GM is everything. Let’s do this for them! I’m committed enough that I gave $50 and I’m currently not even working. For me this represents 25% of the money I set aside for personal entertainment while I look for a new job. Help me help them. The chess community as a whole will be richer for it. Down here is where I normally put my Patreon info. But this one is all about them, not me. 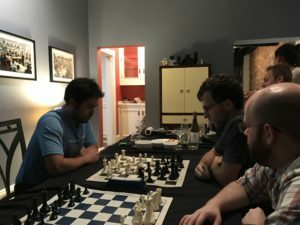 Author wainscottPosted on July 21, 2018 Categories Chess JournalismLeave a comment on These Guys Want to Meet a GM. Let’s Help Them! 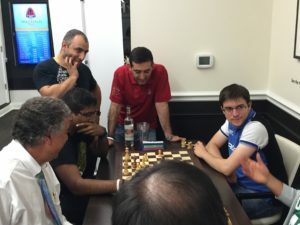 Sutovsky Interviews Gelfand, Ivanchuk, Svidler, and More! If you are like me and enjoy quality interviews with chess personalities then here are some links to some amazing interview that ACP President GM Emil Sutovsky recently conducted. Thank you thank you thank you to GM Sutovsky for not only conducting such wonderful interview, but also for making them so accessible to everyone! Author wainscottPosted on July 9, 2018 July 9, 2018 Categories Chess JournalismLeave a comment on Sutovsky Interviews Gelfand, Ivanchuk, Svidler, and More! The World Championship is Boring! These discussions always devolve into some sort of “How can the players be made to play more interesting chess?” discussions. Simultaneously with that there are discussions about women’s chess. How “everyone knows” that “those games just aren’t as good” etc. Ten days ago the Women’s world championship began in Shanghai. I felt like I was one of maybe 1% of chess fans who knew this match was taking place or cared about it. Then I see my friend Sabina tweet this. And she’s absolutely right. Because truth be told, the handful of discussions I have seen about this match have mostly been “box score” style tweets/posts/etc. pointing out the results of the most recent game. First, this is a world championship. Therefore, by definition it matters. Next, if someone is going to complain that the World Championship match between Carlsen and Karjakin was boring because there were too many draws then perhaps they should open their eyes and look at this match. In the seven games completed so far there have been two draws. Two. The quality of the games has been good. Game One saw a long attempt at pressing an ending that fizzled out into a draw. Game Two seen Ju sac a pawn for great initiative that she smashes through and converts. I suspect that the pgn file for this game is wrong since 56…Rc1+ wins easily. It’s hard to believe that Ju missed this and that Tan would then miss the draw after 57.Rxd1. In Game Three Ju took a 2-0 lead in the match with an absolute crush. Tan played 14…g5 which seems quite silly with the king in the center and no real way to bring pressure on White’s kingside. Down two games, the World Champion strikes back. After a relatively unambitious opening (some sort of Torre/Colle thing…don’t ask me, I’m not an openings expert!) Tan gets a little pressure building on the kingside when Ju overextends herself. Tan first cracks open the kingside and then finishes the game off with a beautiful queen sac. In the last game to the played in Shanghai (the match is split with the first five games in Shanghai and the final five in Chongqing) the champion decides to again attempt an unambitious opening (this time the Bishop’s Opening) but the challenger again moves her lead out to two points at 3-1 by first building up a strong center and then showing some excellent technique in converting it. In the first game in Chongqing the champion again brings home the full point, this time in a 125 move marathon. Pay attention to the beautiful idea with 26…c4. I like how Tan gets rid of her own potential backwards c pawn target in a way that forces Ju to either cripple her own structure to “win” the pawn which she will likely lose back eventually and then be faced with a dangerous looking queenside majority or to play as she did and simply give back the pawn immediately. Now Tan has left Ju without a target and at the same time forced her to air out her king a little bit. After then winning a pawn and getting rooks off the board Tan shows why she’s a champion by patiently converting a queen ending. Game Seven was a draw that never really got off the ground too much. I would imagine the players were exhausted after the Game Six battle. So there you have it. A match which has been anything but boring that seems likely to conclude in a quite exciting finish! Author wainscottPosted on May 13, 2018 May 13, 2018 Categories Chess JournalismLeave a comment on The World Championship is Boring! Somewhere around a year or so ago I heard that top Cuban GM Leinier Dominguez was going to switch federations to the USA. While I was hearing this from a very reliable source it seemed to be rather surreal. After all, So had just switched to the USA a couple of years earlier and Caruana had just come home a while after that. Could we really be on the verge of landing another super GM? As was pointed out to me, however “You’ll notice he’s not playing in any FIDE events.” I realized that was true. Part of switching federations is a two year absence from competing in FIDE events. So no World Cup, Olympiad, Grand Prix, etc. As I had been asked not to say anything I have been sitting on this news for some time. However, just the other day Emil Sutovsky mentioned this in a post on Jacob Aagaard’s Facebook page. So with the cat finding the entrance to the bag I suppose it’s time to say something. What an exciting time this is for American chess. If Dominguez is actually transferring and is able to complete his transfer in time then presumably the US could have five 2700 players on our Olympiad squad! Author wainscottPosted on May 5, 2018 May 5, 2018 Categories Chess Journalism8 Comments on Dominguez to the USA? For the last several days I haven’t posted. That’s because I’ve been in St. Louis at the US Championships. 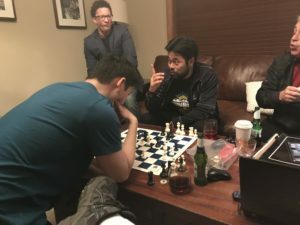 At one of the late night parties at the chess house I met Zviad Izoria, and let me tell you, he’s one of the funniest guys I’ve met in the chess world! I was actually able to hang out with him on two separate nights and had an absolute blast both times. Meanwhile he made quite the sensation on the board as well. He scored two wins in the event, one against Hikaru Nakamura, and one against newly minted world championship challenger Fabiano Caruana. His win over Fabi came with the black bits in round four. They were in a level endgame when Caruana blundered. Zviad then converted with precision. Three rounds later in his game against Hikaru he technically won on time as Naka flagged, but he had a won position over the board already. So it looks like he had some good days at the office at the board as well!